Yesterday I went with Sadegh to the old carpet bazaar, Bazaar Farsh, down in the old centre of Tehran. Entering this place, which was built by the Bonakdarian family in the sixties, always brings back a wave of memories from all the previous years I have purchased carpets here. Outside, one of the old “barbars” or “carriers” were sitting, old and completely worn out by carrying bundles of carpets on his shoulders, his back twisted into a never healing U-shape. Sadegh gave him some coins. Further down, three full grown sheep were tied to a tree. On the end of the day, they would all be devoured in portions of kebab, leaving nothing but some intestines and a bundle of wool. The coal was already heating. Inside, the old man who guarded this place at night, had his tiny locker on the left hand. On the other side, the guy with the hammer was smashing away as always. His job was to straighten and knock flat the iron bands used for strapping carpet bales, so that they could be used once more. Coming further inside, a view through all the floors opens, with balconies going all the way around, leaving an open space in the centre. All the separate dealers have their small offices turning out to the “balcony”. Some of them have only a few carpets, some have more, filling up the space inside and outside their “ambar” or warehouse. Stepping inside here leaves you blind for a moment when coming in from the killing light and heat in the street, and meets you with the familiar smell of wool, a catalyst for a full scale development of memories. Coming into this “shopping mall”, one cannot go to any randomly chosen dealer asking him to present his stock to you. 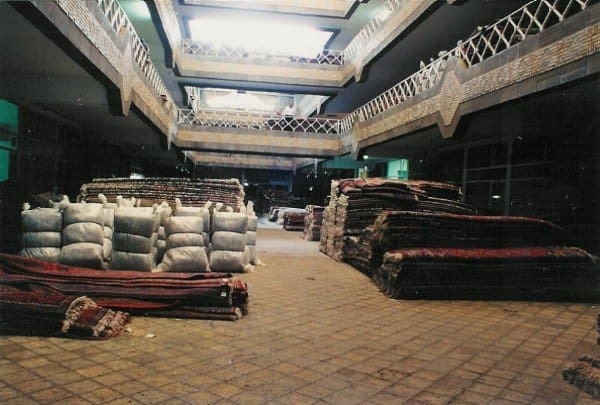 Many of the “dallals” or small traders here operate the last station for the carpets awaiting exportation, and working for their own company, maybe with retailers or wholesalers operating abroad, most of them family businesses. These guys will not offer you anything. A frightful sight is here to be seen, all the “rufugaris” squatting on the floor, with bowls of liquid colour painting new carpets with ugly, electric, synthetic colours, leaving them with two-coloured pile, fresh in the bottom and dull on the tip. However, we went all over the place, seeking out carpets among the dealers which Sadegh knew had something to offer, in qualities that were suitable for me. I selected whatever I found interesting. Then the porters were summoned, taking our carpets to Sadeghs “Ambar” for a more thorough examination. My goal was to find a good selection of 4 square meters rugs. It soon became apparent to us that a good selection of such was nowhere to be found in Teheran. The carpets I bought in Tehran was really unintentional. But, as ever, hard to resist. Just moving around in the bazaar is “dangerous”, interesting carpets turn up everywhere. Once, on my way to the “Dastshuri”- the toilet, in Rahimiye Aval, I ended up buying two fantastic runners from Nâsrabad. On the same occation, I happened to see the back of two large carpets folded together, and made Sadegh follow me and pretend that he, just by chance, happened to see these carpets later in the day. One of them was 5×4 meters, with Heriz design and wool with vegetable dyes, made in Ardebil. The structure was not good, they were single-wefted with wool and very loose. The quality control that my chosen carpets are going through is leaving nothing unseen. Every one of the carpets collected by the carriers have been thoroughly examined by 5 experienced persons going, literal, all over the pieces, in the best possible working position for a carpet dealer; on his knees. There is absolutely nothing to escape their attention ! Half of the collection loses in the first round; some being bent, some with wawes impossible to stretch, some with funny colours turning visible in this special light etc. One of them was bapticed “Electric Blue”. You can imagine! Every carpet was one by one spread out on an even floor, being very revealing for any bulbs and creases. It is absolutely necessary to do this job as I describe it here, since the conditions in the bazaar, with all it’s commotion and variable light, countless spectators with unlimited curiosity, motorcycles and trolleys constantly running over the carpets, leaves you in a very uneasy working situation. I found some very nice Mehraban runners, decorated with flower sprays and small medallions on dark blue foundation, and measuring on the average 85 x 300 cm, some fine Bactiary carpets 3 x 2 m, new but with vegetable dyes, although the yarns were machine-spun making them look a tiny bit mechanical. I bought three very fine tabriz 2.0 x 1.5 m, made around 50 years ago with Heriz design made with “rang ghiaï”- natural colours. 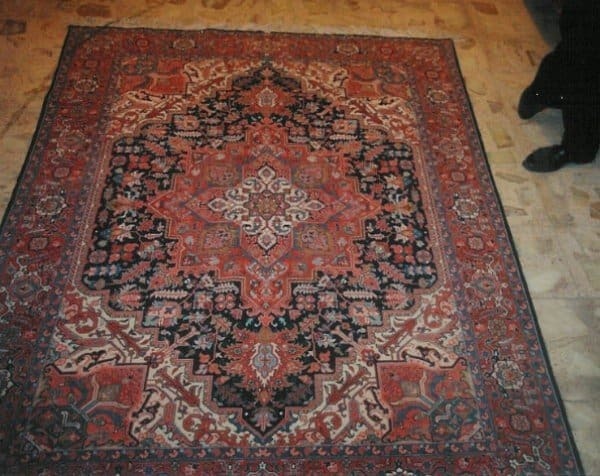 To both mine and Sadeghs surprice we found, in Bazaar Rahimieh Aval, two large, half old Karadja carpets, decorated with all-over medallions in the Lambaran style. They were in a quality unknown to both of us. Unfortunately we had to send back an old Bidjar, a large dozar, suffering from a typical middle age syndrome, a very visible belly and impossible to cure, even by starvation. In contradiction to myself, the Bidjar was born with this figure. A substantial number of carpets were returned with suggestions of prices below the one originally mentioned by the bazaries. Every one of these offers were rejected. The Teheran dealers are so spoiled! On this trip to Iran we saw very few old carpets at all, being no surprice to any of us. During my last visit, in 1991, I estimate that 25 % of the carpets bought were between 40 and 80 years of age. This time, a bazaari introduced a carpet to us as “Gheili Aantik” – very antique. Here, most people have not an idea of the meaning of this fine word. They have heard the word mentioned as a slip of the tounge by people, like myself, and have made up a translation for themselves of the meaning of this word, like “pretty”, “beautiful” or equivalent. Upon a direct question to the owner about his idea of the age of this carpet, his answer was 40 years. Both Mohammad, Sadegh and myself were convinced that the age was considerably less. Neither it’s colours, it’s wool or it’s patina suggested anything to put us on the lead of a sensible suggestion. The speculations ended with a never ending laughter when it turned out that Mohammad suddenly had spotted a date knotted into the pattern on one side. It was 4 years old!